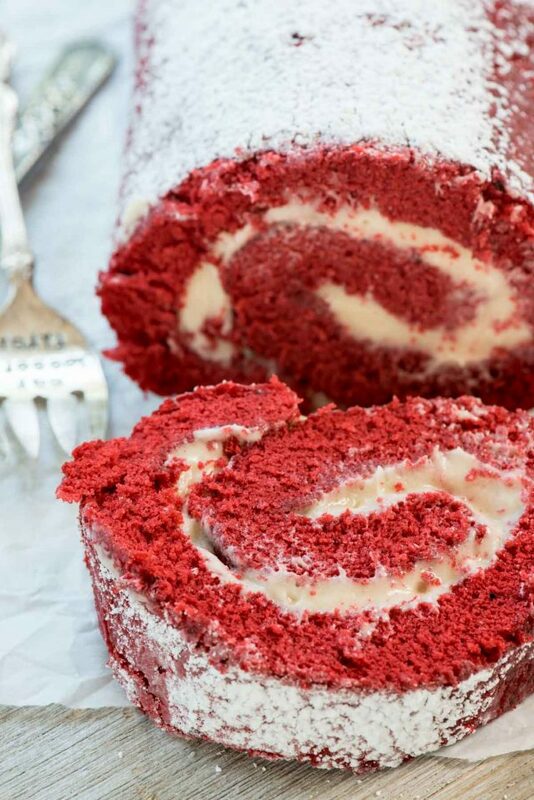 Red Velvet Cake Roll – this easy red velvet cake recipe is rolled up in a roulade – it’s the perfect cake for any occasion! Plus it’s filled with CREAM CHEESE FROSTING!!! After Jordan finished grade 3 or 4, I didn’t expect to make friends with the other “school moms” anymore. I had a unit of gals I’d met in Kindergarten and first grade that did mom’s nights and events and fun things together and once she got to 3rd grade I started seeing less and less parents, which made it harder to make new friends. More and more moms headed back to work by grade 3 or 4 and it dwindled from everyone walking up to drop and pick-up kids from the classroom to just me and a few others to none in 6th grade. So I was pleasantly surprised when Jordan made a new best friend last year and I became friends with the mom. Of course, with any new friend of Jordan’s, I would introduce myself, get to know them a bit (guns? drugs? violence?) before letting her head to their house for a playdate but never had it gone much further than that, until this time. Jordan’s BFF’s mom and I have a lot in common, especially parenting-wise. We have a lot of the same parenting philosophies which gives us lots to talk about since out here in the ‘burbs it sometimes ends up seeming like we live in an episode of Big Little Lies. ANYWAY, I love this family (both the daughter and the mom) which is a good thing because Jordan and her daughter are somewhat inseparable. She even came with us on our Disneyland trip this past June. Mom had her birthday a few weeks ago so of course I had to make a special treat. Daughter told me she likes all treats (another reason we get along, ha!) but also that she loves red velvet. BINGO, I said to myself. You know the one kind of cake roll I haven’t made yet? That’s right my friends, Red Velvet. A Red Velvet Cake Roll is easy and delicious and makes the most stunning dessert for any occasion! Like I said, I’ve made TONS of cake rolls. I’ve made zucchini and carrot, pumpkin and coconut and even lemon and strawberry shortcake (my most popular). But I’ve never made red velvet before…until now. This cake roll is fluffy and sweet and vibrantly red and it’s sandwiched with cream cheese filling. I mean, really. The only reason anyone eats red velvet cake is for the frosting, am I right? I think I could eat a whole bowl of the filling with a spoon. The soft and not-too-sweet red velvet cake pairs perfectly with the sweet and somewhat savory cream cheese frosting. Luckily, cake rolls are great for birthdays and parties, but they’re also good just because. There’s nothing like wowing your guests with an elaborate cake roll they think is magic when really, it’s easier than you think. Trust me: you can make a cake roll. I thought I couldn’t for years and now I can’t stop making them! Make sure and beat the eggs at LEAST 3 minutes as it says in the directions. This creates the fluffy cake you see in the photos. Use a cake roll pan (also called a jelly roll pan) for best results. You can make the cake portion up to one day ahead, just wrap it (in the towel) in plastic wrap so it doesn’t get stale. If the cake cracks, double the filling and frost the outside – no one will know. Check out my cake roll photo tutorial, a cake roll video, and my tips for cake roll success. 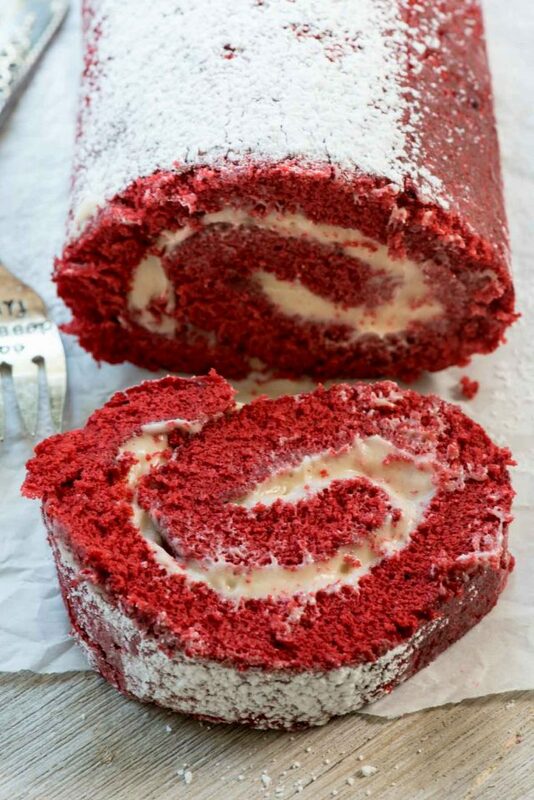 Red Velvet Cake Roll - this easy red velvet cake recipe is rolled up in a roulade - it's the perfect cake for any occasion! It's a red velvet sponge cake baked in a jelly roll pan and filled with cream cheese frosting. A dusting of powdered sugar on top makes this an easy and elegant dessert. Make the filling: beat cream cheese and butter ntil creamy, then mix in powdered sugar slowly. Add vanilla and beat until smooth. To fill cake: Carefully unroll the cake. Spread with the frosting. Carefully roll the cake back up as tight as possible, unsticking it from the towel as you go. Chill for one hour before slicing. Before serving, dust the top with powdered sugar. If the cake cracks, double the frosting recipe and frost the outside as well - no one will know! 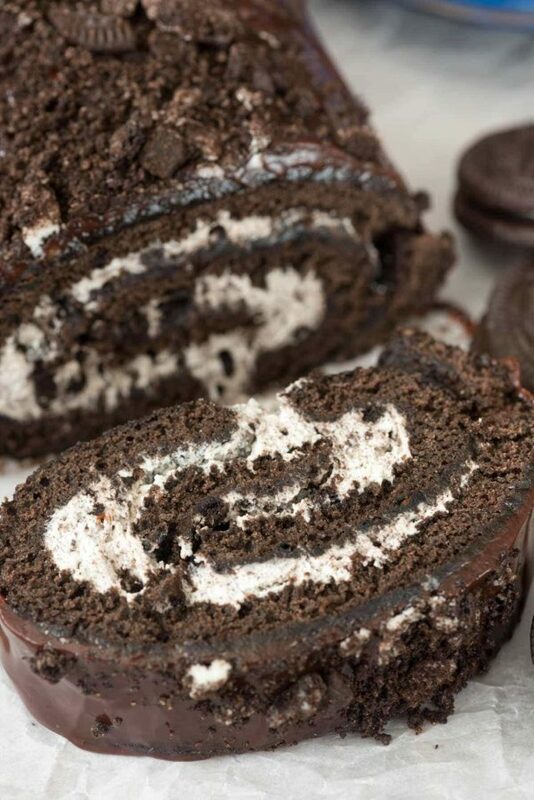 If you love desserts and cake rolls, be sure to check out TheBestDessertRecipes, Cinnamon Cake Roll by Wine & Glue, or a Cookie Dough Cake Roll by Grandbaby Cakes. Surprised you hadn’t made a red velvet cake roll yet since you’re the cake roll queen! Not only that, but it’s a scratch RV cake AND you cakeroll’ed it. You’re awesome. And that is so nice that you and Jordan both made new friends! I totally agree, it’s harder clicking with the moms the older the kids get. Lucky for you both! Looks fantastic, as usual. Great food and good friends…what more could you ask for? I miss the days at the Catholic grade school with all the moms (well, most of them) , but so many did go back to work full time or their husbands got transferred to another state. What a cool cake you made – red velvet is sooo pretty! It’s always nice finding friends in unexpected places. 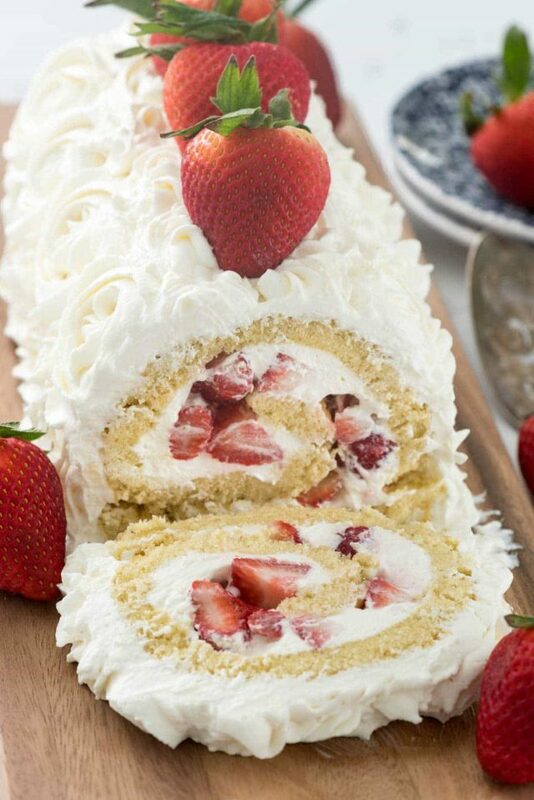 This looks SO good, how have I never made a cake roll?? Have you tried making a gluten free cake roll? It would be very much appreciated! 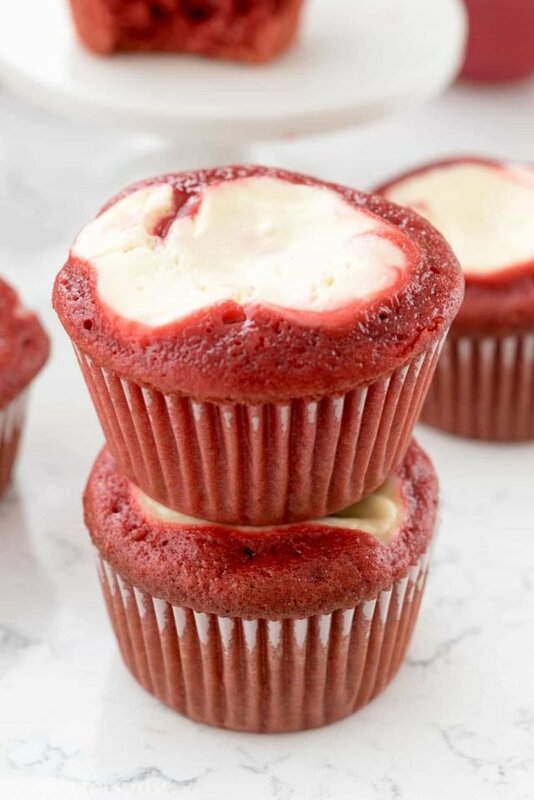 Love me some red velvet! It might be very tasty! I want to try it! The addition of the food coloring isn’t in this recipe.